This past week has been very tough on me. I had to finish reading The Hunger Games before going to the movie on Thursday. It was a pressure cooker and I finished the last page during the trailers - just in time. The book (the first one at least) is worth a read and very entertaining. The reason I bring this up is not to transition into a book review site (no chance) but as an excuse for not posting this week. It's hard to believe I've been a "foodie" in Chicago for a few years but had never been to Kuma's. 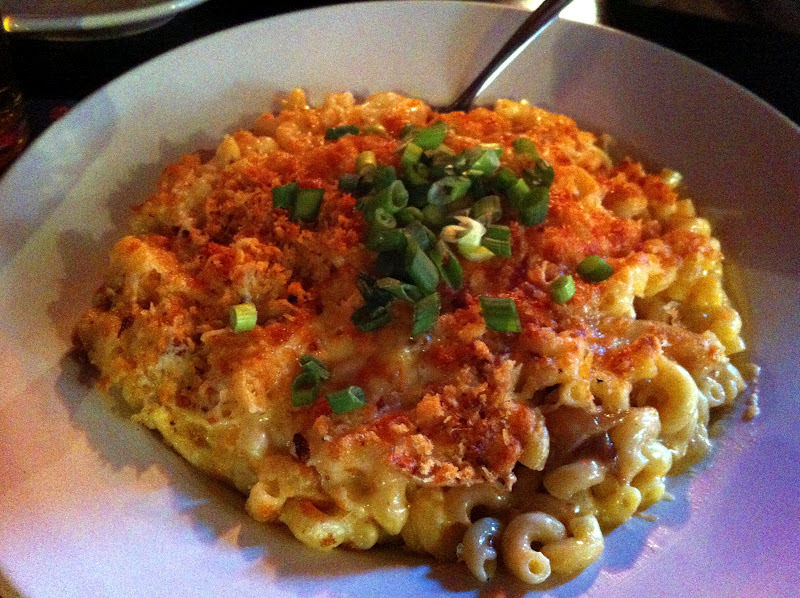 There's a cult following and is considered an institution locally and nationally. It's a small, heavy metal "bar" so seats are very limited and wait times can get absurd. Luckily we sent Erica ahead to put our name in at the open because we needed a rare table for six. We were celebrating Jean's birthday (Erica's mom) with her family. I didn't know what to expect but everything was true to form. It's a metal bar with like minded employees, graphic posters and enormous burgers on pretzel bread (though it's still very family friendly). Just for added emphasis the list of rules is as follows - 1) We do not take reservations. 2) We will not “put on the game, bro” 3) No music requests. 4) No Minors after 10pm. 5) Our kitchen is only 16×6. Please be patient. The menu is 20ish burgers and a few other sides/starters. 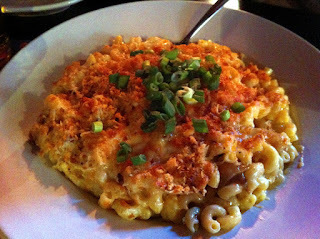 Not to be missed is an order of customized mac n cheese. The small is enough to feed six people and absolutely fabulous. 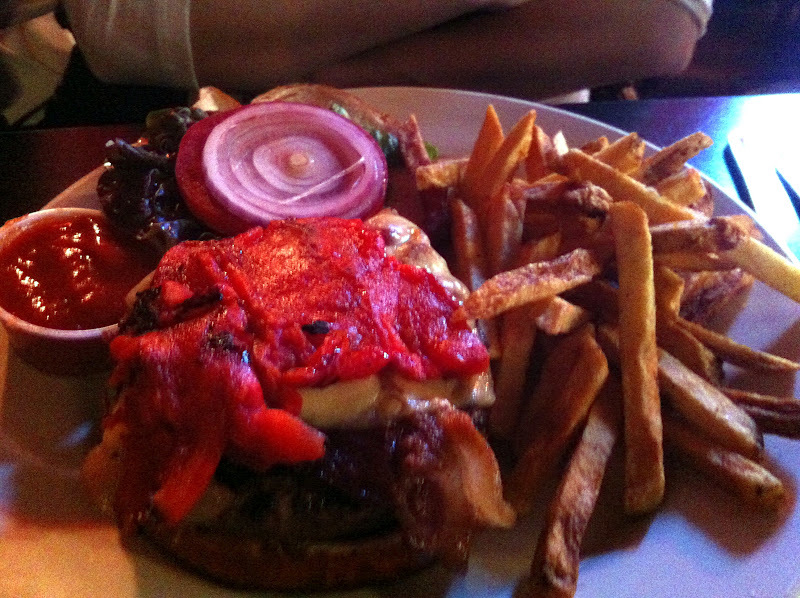 All of the burgers are named after rock bands including Led Zeppelin, Pantera, Black Sabbath, etc. I went with the Plague Bringer (Roasted Garlic Mayo, Tortilla Strips, House Made Hot Sauce, Fresh Garlic, Pepper Jack, Sliced Jalapenos), and other selections at the table included the Neurosis, YOB and High On Fire. Everyone only ate half a burger because consuming an entire one, with fries and mac n cheese would be a triumph. I really liked my Plague Bringer with a nice dose of heat but great meat a nice garlic mayo for balance. 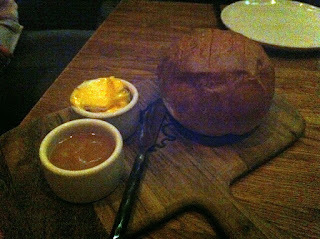 I also think the pretzel roll idea is awesome because that is not a flavor normally associated with hamburgers. The new"est" location for M Burger is in the Illinois Center and is definitely not as interesting as the first location carved into the back of Tru. Maybe it was all of the other fried and fast food places in the food court confusing my sense of smell and taste, but my most recent M Burger experience was not as great as my first few. Two years ago I wrote M Burger reminded me of In 'N Out invading Chicago. Simple menus without a lot of choices, nice packaging and secret menu items. Most of that is still true today but for whatever reason the food did not have the same "I need that again" feeling. It's still pretty good value for high quality fast food burgers and chicken with a single hamburger @ 2.49 or a Hurt Burger (my favorite) for $4.49. I thought the fires were very mediocre this time and were not that hot - and we ate 5 feet from the counter. I did not order a shake but many of my friends did and had good things to say. 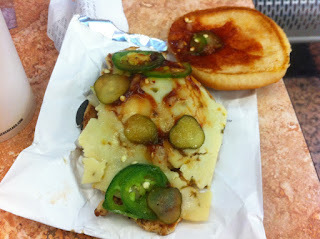 The Hurt Burger (or Hurt Chicken) is my personal choice and comes with bbq sauce, pepper jack and jalapenos in amount depending on how much you want to "hurt". I love spicy and I love bbq so it's a good combination for me. 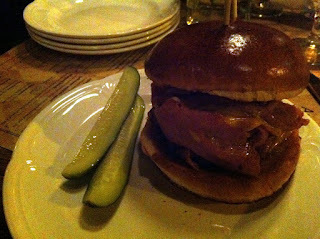 While M Burger might not have the best burgers in town, they do challenge for great fast food sandwich that is not a chain. The formula of burgers, fries and shakes is well suited for Chicago and the loop location should give the lunch crowd a better option for a quick meal. It had been a while since I ventured back to XOCO, mainly because every time you fly out of O'Hare it's hard to avoid grabbing a torta before boarding and thus my bayless cravings are usually satisfied. A few Saturday's ago I was leaving the office and Erica and I were on our way to the gym (kind of bad timing to grab a lunch but oh well) and stopped by XOCO to grab lunch. It was noon so the line was ridiculous to dine in but I just walked up to the cashier to place my to go order (a handy tool for those on the move). I went with a chicken torta for Erica and the Saturday special of braised goat. 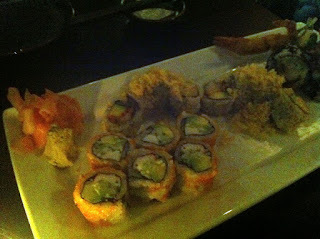 For a number of reasons my second visit was not as memorable or tasty as my first. Getting the full experience of ordering and getting a seat and sharing some chips and guacamole is probably better than eating a sandwich out of a box in the car. Also, the tortas from XOCO are the same as all of the other Frontera outposts - the airport and now Chase Plaza in the loop - that the novelty has worn off. My goat was quite tasty though and if you add a little of the hot sauce it all comes together well. Erica's chicken was not very good though and appeared to have all the dark meat scraps instead of nice chicken pieces. 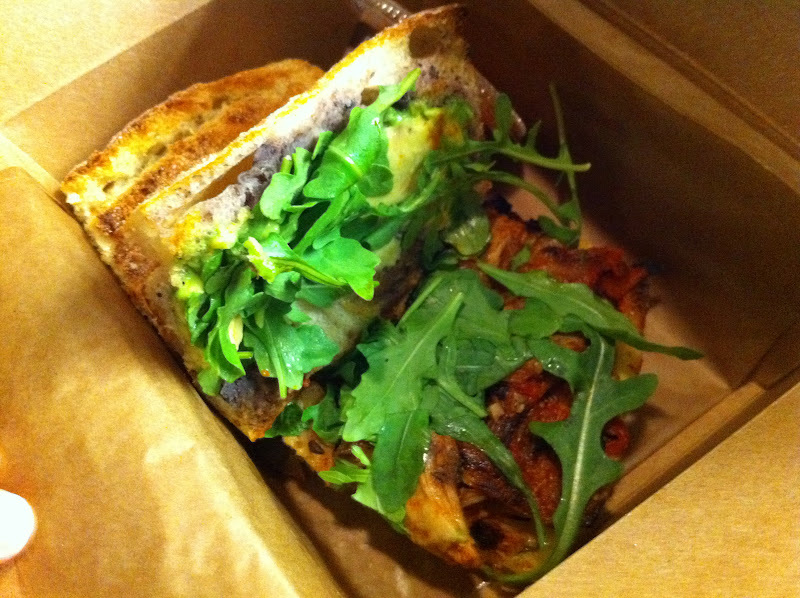 Finally, it's hard to get too excited about paying $25 for two sandwiches, even if you ate in the restaurant. 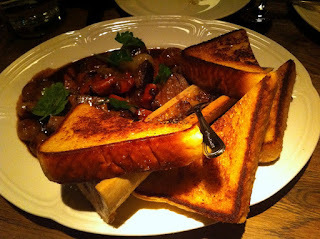 I still like and recommend XOCO as a fun and different spot to get tasty mexican. It's not cheap and always crowded at peak times but there's still nothing like it in the city. 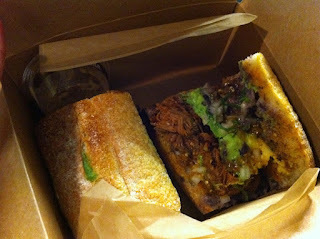 I wonder if XOCO will offer something different since more Bayless Tortas will be available in the loop. In any event it's different and fun and usually tasty. It's no secret I really enjoy going to Macy's for lunch because of their Seventh floor food court featuring Rick Bayless, Takashi and Marcus Samuelsson. 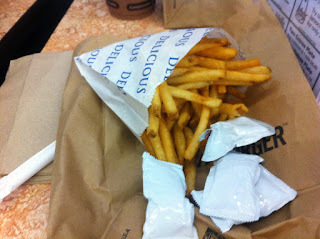 It's really nice to get a gourmet lunch quick and easy. Relevance? There will be a book signing and cooking demo by Cat Cora, another member of the Macy's Culinary Council. It's next Monday and should be fun. Details below. 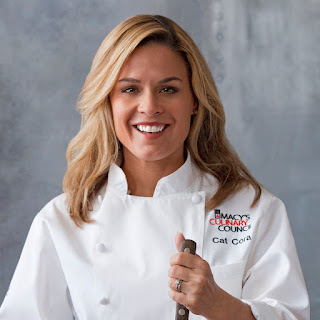 Cat Cora, Macy’s Culinary Council Chef, will host a cooking demonstration and book signing at NOON on Monday, March 12 at Macy’s on State Street. She will demonstrate some of her favorite recipes from Cat Cora’s Classics with a Twist: Fresh Takes on Favorite Dishes, including: Pita Bread Salad, Grilled Middle Eastern Turkey Meatballs with Horseradish Feta Cream and Rolled Pistachio Baklava. Since making television history in 2005 as the first and only female Iron Chef on Food Network’s Iron Chef America, Cat Cora has become one of the largest names in the culinary community. In May 2012, Cora will be expanding her repertoire to host, as she steps out of her chef’s jacket into this new role alongside co-host Curtis Stone, in Bravo’s new reality series Around the World in 80 Plates, which follows 12 chefs competing in a culinary race across 10 countries in 44 days. 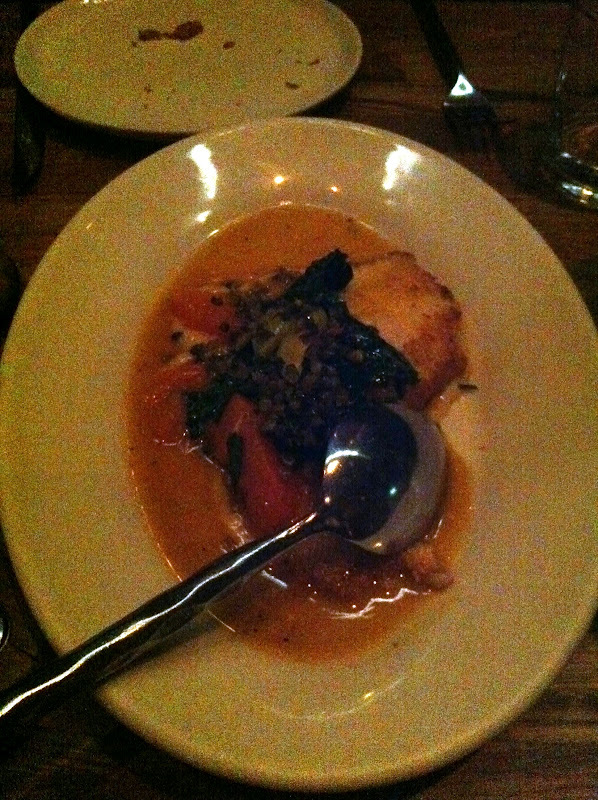 Beyond her television credits, Cora is also a contributing food & lifestyle editor for O, the Oprah Magazine. 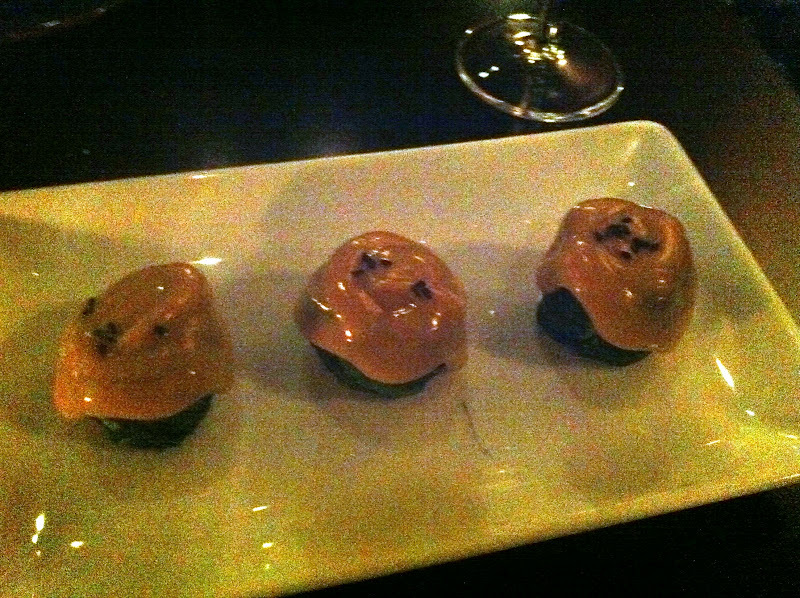 To date, Cora has successfully launched several unique restaurant concepts. In 2008, she partnered with Macy’s to open Cat Cora’s Que (CCQ), a casual barbeque restaurant featuring her favorite takes on global BBQ. In 2009, Cora partnered with Disney to open Kouzinna by Cat Cora at Disney’s Board Walk Resort. Cora is the author of three top-selling cookbooks and in March 2011, the mother of four boys, released her first children’s book, Suitcase Surprise for Mommy (Dial Books, 2011) a sweet and comforting tool for kids and parents to use when Mom or Dad have to travel. Cat will be on hand following the cooking demonstration to greet fans and autograph her Cat Cora’s Classics with a Twist: Fresh Takes on Favorite Dishes , which will be available to purchase at the event. Macy’s Culinary Council is a national culinary authority comprising some of the nation’s leading culinary masters, including Rick Bayless, Michelle Bernstein, Cat Cora, Tom Douglas, Todd English, Marc Forgione, Emeril Lagasse, Marcus Samuelsson, Tim Scott, Nancy Silverton, Ming Tsai, Wolfgang Puck and Takashi Yagihashi. Launched in 2003, MCC’s team of distinguished chefs serves to inspire the way Macy's customers shop, cook and eat at home. The chefs are both ambassadors and instructors, providing expert culinary advice and leading cooking demonstrations at Macy’s stores, with the aim of teaching customers how to cook and shop like a master chef. This sponsorship is brought to you by Macy's and Everywhere who we have partnered with for this promotion.